From The Front Seat of My Car is a series of essays where I share my findings from research that begins with the logos and graphics I see from... well, the front seat of my car. While heading south on Providence Road in Charlotte, NC, I quickly noticed these thick yellow lines on the back of an aerial device truck in front of me. (GD scan begins) The negative space of the thick, yellow lines form an interesting-looking "A". Then, the "A" "L" ligature and tight kerning throughout the word "Altec". I'm sold; and immediately take out my phone to snap a photo. Not 15 seconds later, I glance down towards the bottom of the truck and the mud-flaps have the same design... but one-color! It might be blurry, but I couldn't resist. Here it is, in all it's glory, the Altec A.
I had never heard of Altec before I noticed their logo, so I wanted to get some basic information. Altec Inc, founded in 1929, is "a leading equipment and service provider for the electric utility, telecommunications, contractor, lights and signs, and tree care markets." (Altec Inc) Basically, they specialize in areas that I have absolutely no knowledge or expertise; but damn, do they have a solid logo. And now begins the search to find the origin of the Altec "A". 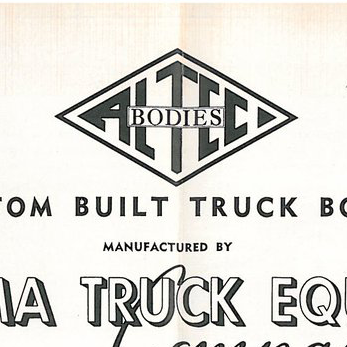 First, I wanted to find any older logos that Altec previously used. Luckily, Altec's Twitter account started the "#altecarchives" hashtag so I was able to find a handful of old photos and advertisements with some older designs. The following are a few examples of what I found while going through their posts. These older Altec wordmarks don't visually resemble the current identity, but there are some similarities. All the logos have a bold and sturdy feel and look, just like their trucks and equipment. Also, they all use the entire word "Altec," but in different styles and formats. The biggest difference between the current logo and the previous is the tightly kerned Helvetica, which is quite the contrast from the previously used typefaces. Although, the "A" icon actually feels pretty similar in style to the older wordmarks; I like the juxtaposition between it and the Helvetica. Unfortunately, I have not been able to identify who designed any of these logos. With all the different designs found throughout the #altecarchives, I'm thinking that a lot of those were created by the in-house production artists at the time. The earliest trace (that I found) of the current logo being used is from the 1990s, but there is a strong possibility that it could have been implemented in the late 1980s. I'm not sure whether the current logo and branding was designed in-house or if it was contracted out to a studio. For some reason, Altec seems to have no interest in providing information regarding the creator of this simple, yet strong identity system. Altec's "A" is a great example how versatile a logo can be when it's well-designed. Regardless if it's displayed really big (like 10-feet-tall on the left) or really small (like a metal plate on the right), the logo pops out right at you. Once you connect the "A" with the Altec name, you can't help but notice those thick lines all over the place. Altec Inc. "Altec Web Linking Assets." Altec Inc, https://www.altec.com/about-altec/altec-website-linking-assets/. "2003 International DT466 Altec 55 foot Bucket Truck." https://tinyurl.com/yb5hts89.